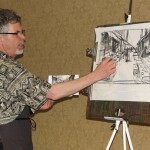 This weekend is the Watercolor Society of Oregon‘s Spring Watermedia Convention. If you live in anywhere in the Portland, Oregon area, I highly recommend it. 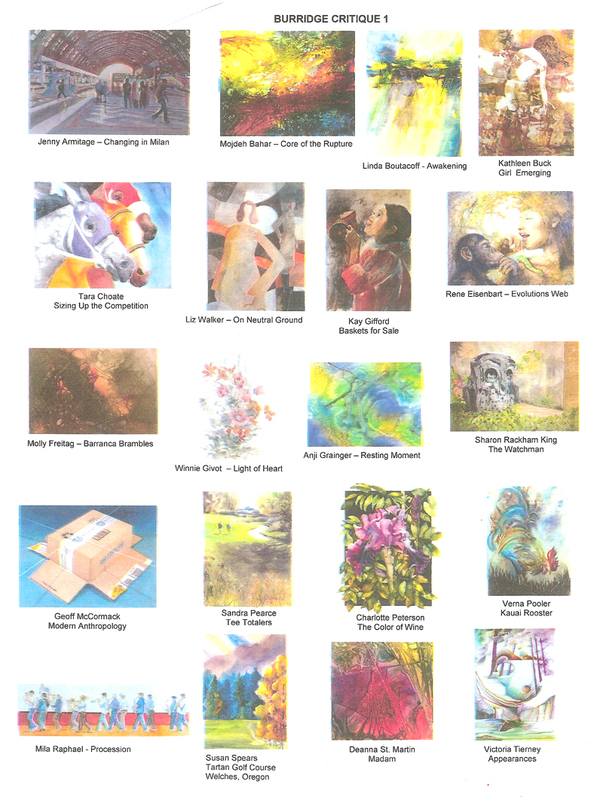 The 80 paintings (of over 300) that made it into the show will having for the next month at the Hillsboro Public Library before the 20 award winners begin a tour of the state. 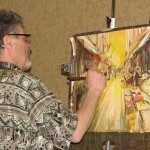 The juror of this convention is renounced painter Robert Burridge, one of the most prolific, awards, and profitable painters today. I thought about taking the juror’s workshop, but decided against it. Burridge works a lot in acrylics and his style, while enjoyable, is not a style that I strive to emulate. 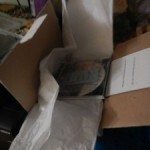 Additionally, I have spent my art money for the year on my upcoming Kentucky workshop. Even without the workshop, the WSO convention is still one of my learning highlights of the year. 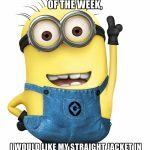 It’s two days of learning new techniques, talking with peers, and art supply shopping. 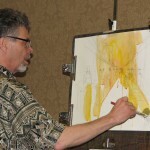 This morning I was up bright and early and at the convention for the 9am session “JURIED IN! Again!” moderated by Geoffrey McCormack. Geoffrey assembled a panel of some of our most talented and awarded WSO members to talk a little about their artistic process and a lot about getting into shows. 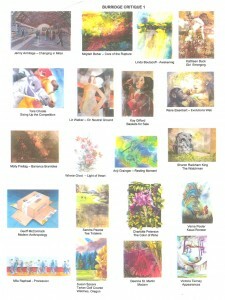 20 artists put up their paintings for a juror critique. BRAVE! When we sign up for the convention, we have an opportunity to have a have the juror critique our painting. Spaces fill up pretty quickly, but not everyone wants to do this because the juror will be critiquing your painting in front of about 100 other people. Still, I like the experience. I’d like to know what the juror thinks could make my painting stronger. And from past experience, I know that I’ll be in good company. 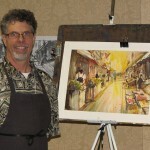 Some of the strongest painters in WSO routinely sign up for this free opinion. There is nothing worse than a critique that your painting is “nice” and Robert had been asked give his honest opinion. Robert took us up on the offer, apologized in advance for any toes he stepped on, and wadded in. Over all I have mixed reviews of the critique, mine in particular and others. While Robert is a good speaker, humorous and capable of entertaining his audience, I wasn’t convinced that he was very thoughtful and often seemed to be going for the easy laugh as opposed to a genuine comment. I was most excited about taking this class because it shows techniques that I think will be very applicable to my fall Keeneland workshop. I wasn’t disappointed. I would really like to take classes from Steve Klier, but he teaches mostly on weekdays (why is is always weekdays?) This is the first opportunity I have had to take a class from him. 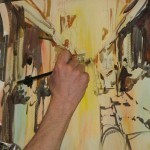 Steve didn’t disappoint, taking a photo of a street scene from start to finish in 2.5 hours. His quick techniques for perspective, figure, and simplification will hopefully help me a lot come the fall. Start to matted in 2.5 hours! 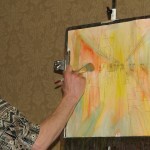 WSO is known for providing great paintings for a strong show, and this was no exception. In spite of my reservations about the juror, I enjoyed his award winners and was inspired that he put so many animal paintings in the show. Usually, in shows, it is obvious that jurors are looking for great composition, strong technique, and uniqueness. This show had all that, but it was also clear just how heavily juror taste can shape a show. Burridge is a strong colorist, but his top painting was a black-and-white piece. Overall, I thought there were fewer abstracts and more representational painting than in other shows. All in all, if I had to do a summary of the day, it would be that I learned a lot. Some of it was worth keeping… and some not.